Town Hall Symphony Hall are delighted to sponsor Season 2 of My Boyfriend Hates Musicals: The Podcast. 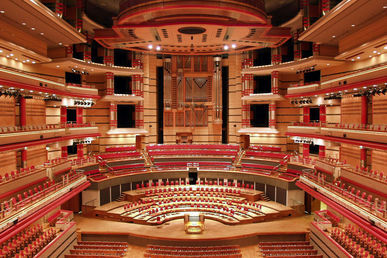 We're so excited to tell you that Series 2 of our podcast will be supported by @THSHBirmingham - We're gonna be bringing you loads of exclusive interviews this year and all the usual laughs! Elise Evans and Scott Clarke have made a Podcast for the lovers and sceptics of Musical Theatre and with a host of musical theatre icons performing at Symphony Hall in 2019, along with PodFest at Town Hall in March, the arts charity are delighted to partner with the Heart FM presenter and her boyfriend, who presents on Capital FM. Some of the leading names in musical theatre will perform at Town Hall and Symphony Hall this year including Kerry Ellis, Michael Ball, Alfie Boe and Lea Salonga. Kerry Ellis has fast become recognised as the First Lady of West End musicals from her starring roles in London and on Broadway. She has also achieved chart-topping success as a recording artist signed to Universal Decca with her debut album Anthems. Singer, actress and Broadway royalty, Lea Salonga, known across the world for her powerful voice, perfect pitch and her Tony Award winning role in Miss Saigon and critically acclaimed role as Eponine in Les Misérables, is coming to Brum as part of her first ever solo U.K. tour. Alfie Boe is one of the best-loved vocalists of his generation and a hugely successful, multi-platinum selling artist. He has triumphed on theatre stages and in concert halls around the world and has two recent UK #1 albums under his belt for albums 'Together' and 'Together Again', made with his great friend Michael Ball. The duo also won two Classic BRIT Awards earlier this year for 'Best Album' and 'Group of the Year'. Multi-platinum recording artist and national treasure Michael Ball is performing at Symphony Hall, supporting his forthcoming studio album Coming Home To You set for release in 2019. The double Olivier Award winner will hit the road in April 2019 until the end of May next year. Tickets go on sale on 07 December at 9am at LiveNation.co.uk. My Boyfriend Hates Musical Season 2 is out from 6 February.